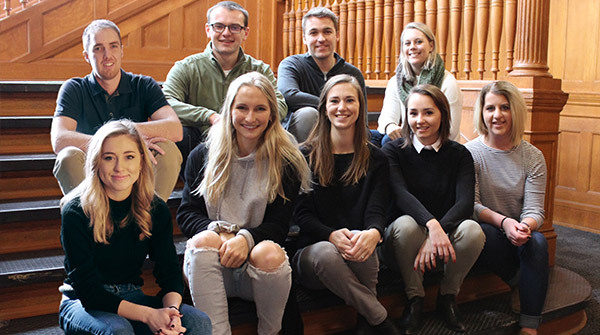 Nine students from the University of Nebraska-Lincoln’s College of Architecture are named scholars of the highly-competitive 2019 Design Futures Council Graduate Presentation Program. The designation is annually awarded to a limited number of students nationally in architecture, landscape architecture and interior design programs. The scholars include Taylor Johnson, Savannah Scoville, Megan Warbalow, Grant Moehlenhoff, Frank Herbolsheimer, Emelia Thompson, Kylie Miller, Benjamin Kunz and Mallory Lane. Scholars are selected based on several factors including demonstrated excellence in design showing a mastery of complex projects; talent for collaboration exhibiting a predisposition for working in multidisciplinary teams; ability to influence others demonstrating their ability to unify through the design process; inclusiveness of sustainability by deeply integrating its principles into their work; and a superior ability to integrate technology into design projects. In its third year, the Graduate Presentation Program aims to connect the up and coming graduating student talent with the hiring managers of the top 300 firms in the design professions. For firms, the Graduate Presentation Program shortens the time and effort required to find the highest quality, emerging talent. For educational institutions, the program not only provides inroads for placement of graduates with high-profile firms, but also provides the opportunity to build enduring relationships with professional practices. “This is a testament to our excellent student work and the high-quality education they are receiving,” said Interior Design Program Director Lindsey Bahe. “The fact that our students continue to be accepted into this prestigious Design Futures Council scholar program at a 100% rate, speaks to the excellent preparation of our students by an incredible faculty and relevant curriculum expanding from the traditional competencies to prepare graduates for a trajectory of informed and meaningful leadership. Our 95% average employment rate immediately following graduation and the national, regional and state accolades students receive continue to affirm the value of their education.” commented Dean Katherine Ankerson. These nine College of Architecture students join a prestigious elite group of scholars from all across the country.